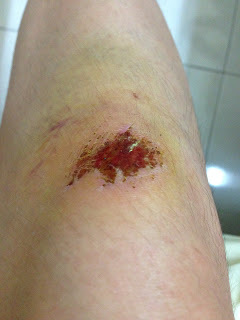 Also, because of my Purpura Simplex condition, I knew right away I will have a huge scar on my knee. And sure enough, I did. From what I thought was just small scratches and then I realised the cut was actually quite deep. Which formed a huge scab. Medicine was applied for anti bacterial purposes. 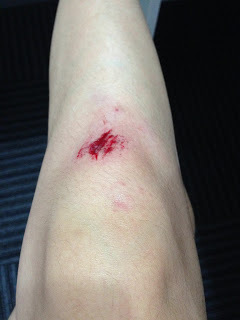 When it started to dry up, I saw that my skin was very dry around the scar area. It started getting itchy but we all know that we can't scratch the affected area otherwise it'll be worst! So, I was in a dilemma. Bio-Oil is a specialist skincare oil that helps improve the appearance of scars, stretch marks and uneven skin tone. It is also effective for ageing and dehydrated skin. Bio-Oil has won 126 skincare awards and has become the No.1 selling scar and stretch mark product in 14 countries since its global launch in 2002. I applied Bio Oil twice daily on the targeted area. Massage gently with the fingertip in a circular motion until fully absorbed. The scar even dropped easily after applying for a few days continuously day and night. Besides, the texture is not very oily and will seep into skin easily so it won't leave a mark on the bed when you apply before sleep. I still continue applying Bio Oil to minimise the appearance of the scar. There is no smell whatsoever as it's natural and it is very long lasting. When I apply in the morning, it lasted even til evening when I touch my scar and it's still moist. Its unique formulation, which contains the breakthrough ingredient PurCellin Oil, is also highly effective for other skin conditions including ageing and dehydrated skin. It is formulated for use on both the face and body. By the way, I posted my scar story in Bio Oil's page and one fine day I received a call to say I won a hamper worth RM100 for being the winning entry for that particular week. Wow! So random haha and never expected to win anything also LOL But thank you so much Bio Oil for curing my scars! Come and join the Muffin Beauty Club where you get to redeem new products from merchants, beauty vouchers and shopping coupons and invitation to beauty workshops and events occasionally. MuffinBeauty is the first beauty review community targeting Asian women. See you in the community which is Asian first beauty review social platform!